We’ve planned to write about Budapest such a long time ago. Growing up in Hungary Budapest was the first city we visited on school trips as kids and many other visits followed that first one. Now we’ve been living here for 2 years. 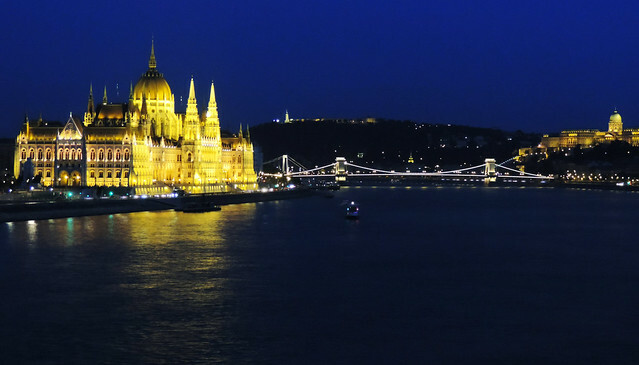 And putting together a complete guide to explore Budapest seems harder and harder. We ourselves explore new places in the city from time to time and maybe that’s why we feel we should wait with that ultimate guide until we explore Budapest properly – which is never. Just as we can’t tick off cities of our list we realized we can’t tick off the one where we live either. There will always be new things – thank God! 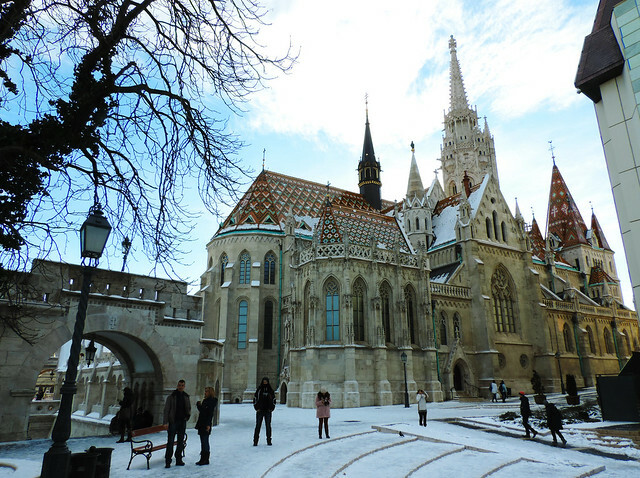 The other thing is that even our most patient readers wouldn’t be patient enough to read through a post that’s about ALL the things worth seeing in Budapest. It would be that long – again, thank God. So instead of a perfect complete guide that we won’t ever have the time to write and you won’t ever have the patience to read, we decided to put together a first timer’s guide as a start. And later on we will write more about quirky little secrets – promise. 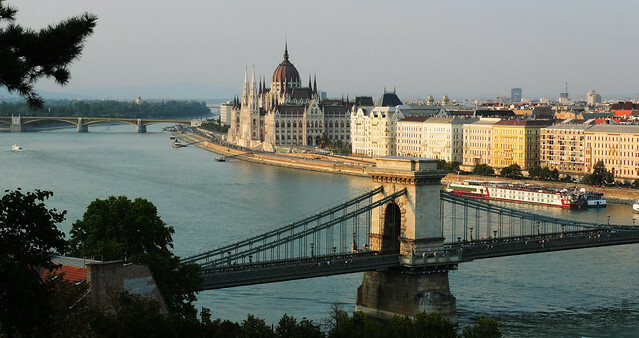 But now let’s see the most beautiful and famous treasures that Budapest offers. In our humble (and not at all biased 🙂 ) opinion the Parliament of Hungary is not only the most beautiful building in our country but also the most beautiful parliament ever built. 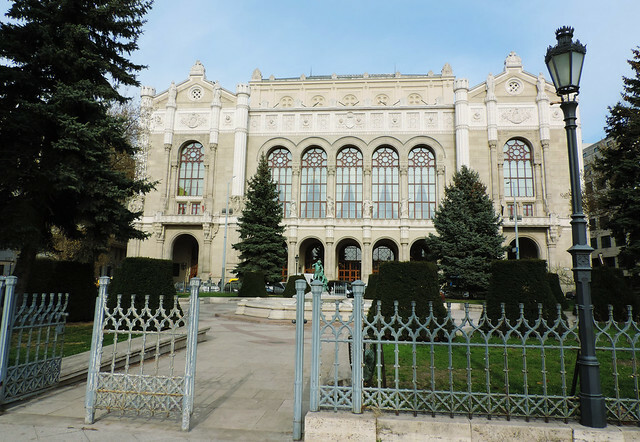 The Parliament is located on Kossuth Square and you can walk all around the building to have a closer look. Kossuth Square is a nice place to relax, too. It has some majestic buildings and statues – and also some little fountains, green areas and benches. You choose your favorite angle of the Parliament and then choose your bench. But taking a look at the Parliament from outside is not everything. You can go inside, too! Anyone can sign up for a guided Parliament tour in the visitor center on Kossuth Square. It’s worth booking one in advance though as they are kinda popular. Read more about the Parliament and our Parliament tour here! 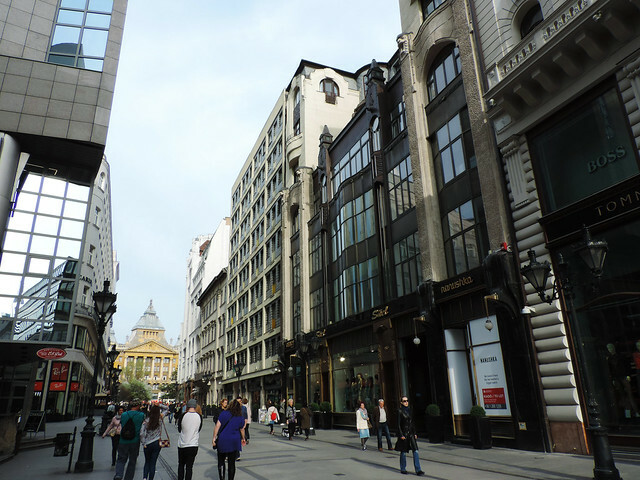 Váci Street is the main walking and shopping street of Pest. Fashion stores and gift shops dominate this street that ends at Vörösmarty Square – a lively square that often hosts different festivals (like the Budapest Christmas market). 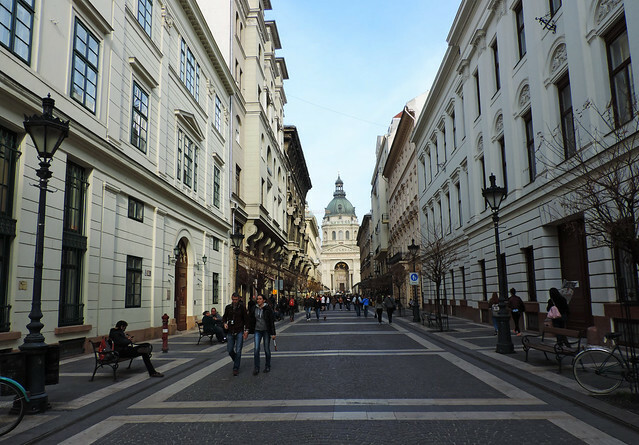 Váci Street and its neighborhood also gives a taste of the amazing architecture of the city center. Szamos Gourmet Palace and Cafe is our favorite place on Váci Street for special sweets like handmade bonbons – or delicious ice cream in summer. Pesti Theatre (Pesti Színház) also stands on Váci Street. It was a cinema previously but nowadays is a theater that offers pieces from almost every genre – musical pieces, comedies, tragedies, classic and modern. We really love this diversity and we’ve seen several great pieces there. Once you are around Vörösmarty Square it’s worth checking out another lovely place nearby: Vigadó Square right at the bank of Danube. It’s famous for its concert hall called “Vigadó” that looks like a palace with its lovely little formal garden. And of course, for the nice views of Buda Castle with the Danube. On Vigadó Square it’s fun to hop on Tram 2 that we just call “the tourist line”. Actually, it’s a regular tram line but its route is along the Danube so it offers quite some amazing views of the city all the way – and you can get off at the Parliament at the end. St. Stephen’s Square (Szent István tér in Hungarian) is also walking distance from Váci Street and it’s home to the giant basilica named in honour of Stephen, the first king of Hungary. This Neo-Classical church is 96 metres (315 ft) tall. 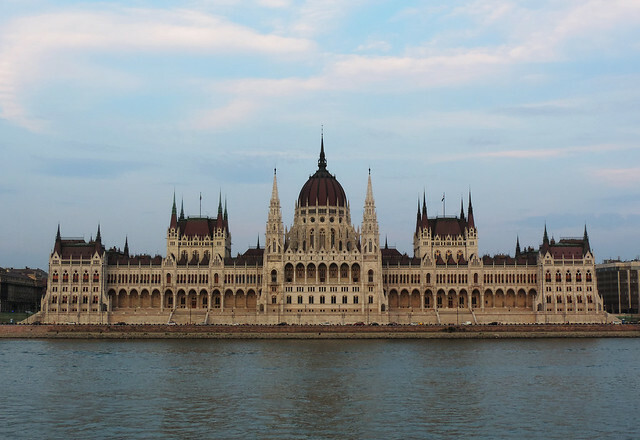 That is the same as the height of the Parliament and they are the highest structures in Budapest. 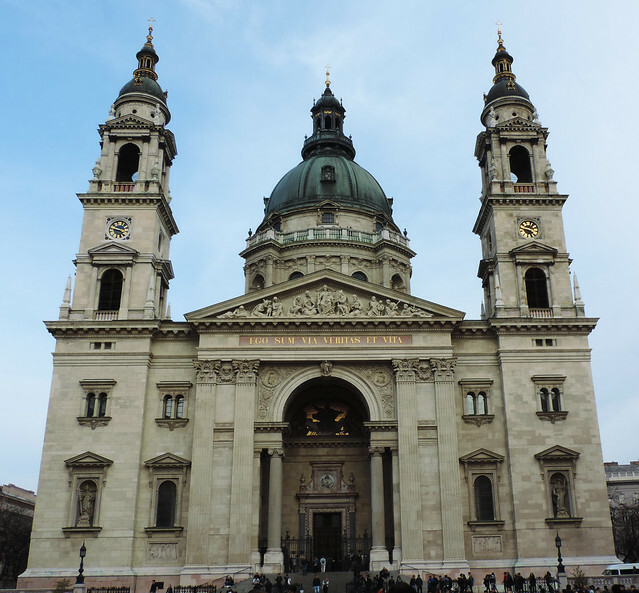 St. Stephen’s Basilica has a stunning interior, too, and entrance is free. However you need to buy a ticket if you want to go up to the bell tower for some nice views. 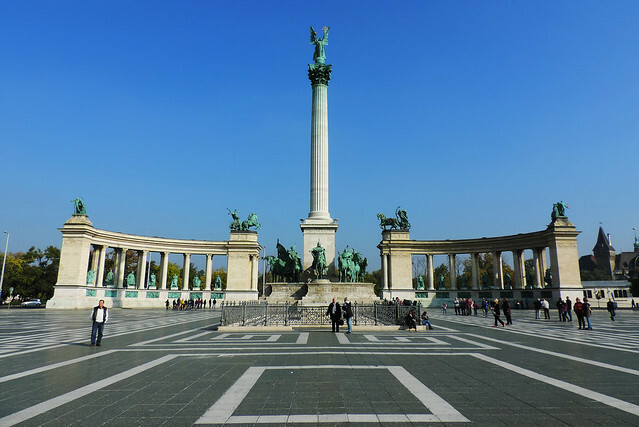 Heroes’ Square (Hősök tere in Hungarian) is a symbolic place. 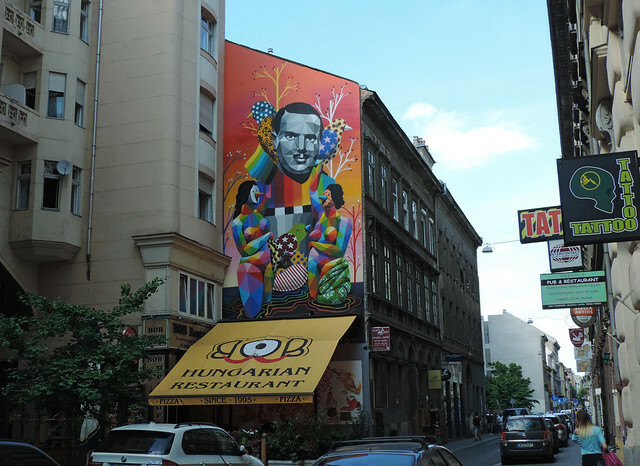 It played an important role in Hungarian history and has been a place for many political events. It’s enclosed by two pretty buildings, the Museum of Fine Arts and the Műcsarnok, and in its very center stands an iconic statue complex. This famous statue complex features important national leaders of Hungary including the Seven Chieftains of the Magyars (that’s how we Hungarians call ourselves) who led their people into the Carpathian basin. In front of this complex is the Tomb of the Unknown Soldier. It’s not a real tomb but a memorial for all the heroes who gave their lives for the freedom of Hungary. 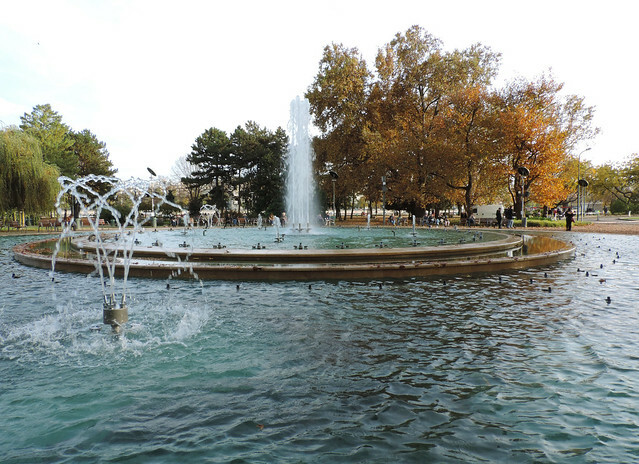 Right behind Heroes’ Square you can take a walk in the City Park (Városliget in Hungarian). 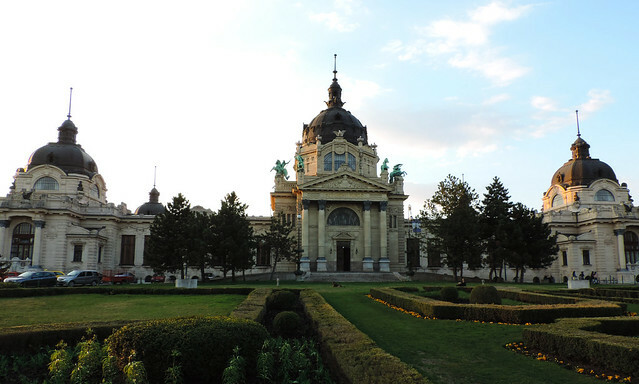 It’s one of the first public parks in the world and it hosts some spectacular sights like Vajdahunyad Castle, Széchenyi Thermal Bath or Budapest Zoo. 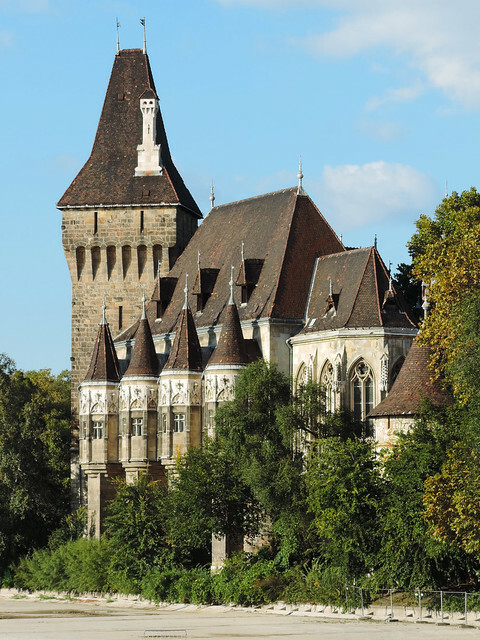 Vajdahunyad Castle is actually a museum, the biggest museum of agriculture in Europe. There’s a lovely artificial lake in front of it that turns into an open ice rink in winter. Chain Bridge is one of the most famous icons of Budapest – and for a good reason! It was the first permanent bridge across the Danube in Hungary – opened in 1849. Also, it was one of the modern world’s engineering wonders at the time of its construction and had such significance in Budapest as Brooklyn Bridge had in New York. And it’s still the most beautiful of all the bridges in Budapest offering great views of both Buda and Pest, by the way. And we haven’t even mentioned the Buda side yet. 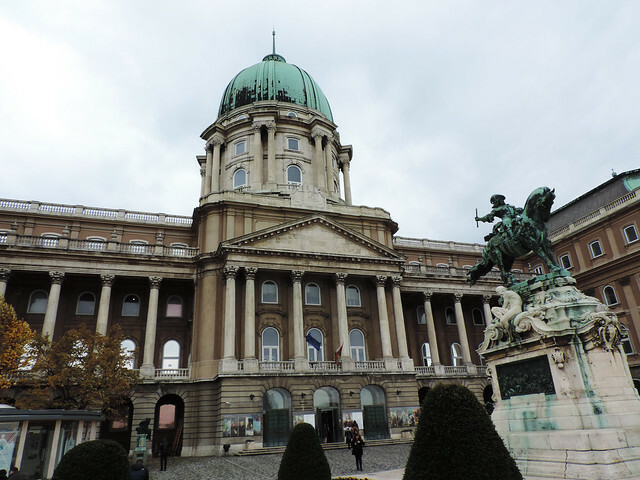 The biggest highlight there is Buda Castle, a castle of the Hungarian kings built in the 13th century. Today it’s home to the National Gallery, the Budapest History Museum and the National Széchényi Library. Most of its inner courtyards and gardens are open to the public for free though and they are amazing! The upper terraces are looking towards River Danube and they offer stunning panorama over Budapest. Matthias Fountain is a pretty piece of architecture itself and there are other fountains and statues here and there waiting for you to find them in the courtyards. Then you can continue to the lower terraces that have been renovated and reopened recently. 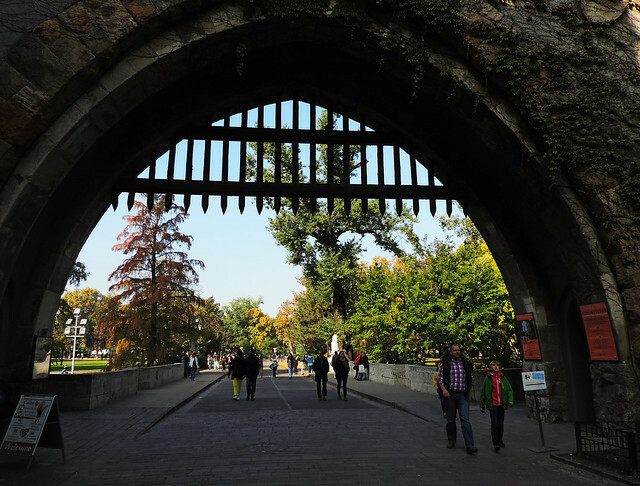 The yards and gardens of Buda Castle are definitely worth a walk – so as the area around it: the Buda Castle District. Its narrow streets with Medieval, Baroque and 19th-century houses and churches enchant us every time we walk there. And we love taking a walk there in any season! 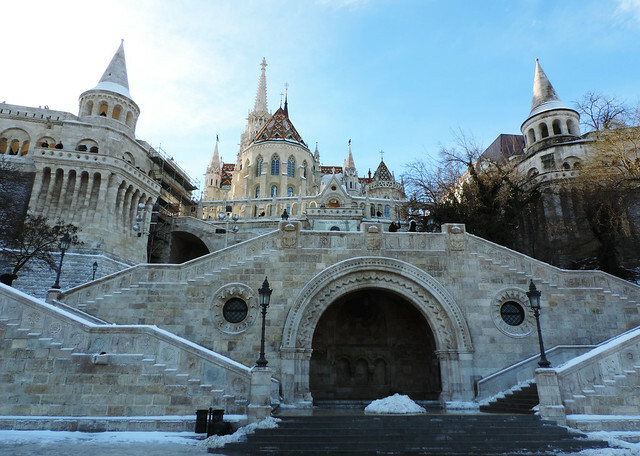 We usually end up at Szentháromság Square where Matthias Church and Fisherman’s Bastion stand proudly next to each other. That means more unique architectural beauties and more amazing panoramas. You can’t get enough of beautiful panoramas, can you? At least we can’t. 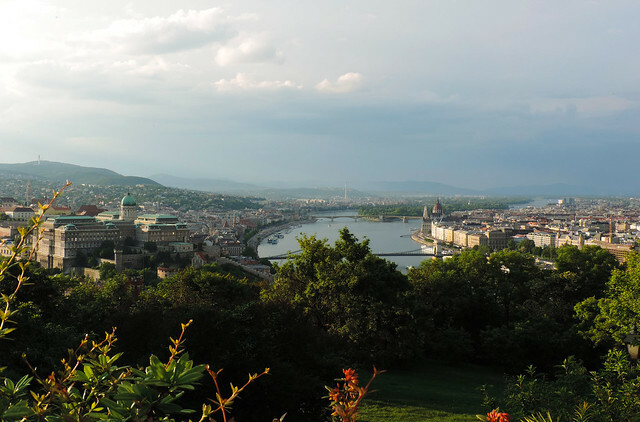 And another favorite spot of ours is Gellért Hill. It’s a refreshing green spot in the heart of the city and it’s especially colorful in spring and autumn. The huge statue “Citadella” is on the top and that’s where you will be rewarded with those beautiful panoramas day and night. If you like city parks there’s another special one: a whole island on River Danube that is all green and is hiding some medieval ruins, pretty fountains and gardens. That’s Margaret Island (Margitsziget), the largest of Budapest’s city parks and the favorite recreation area of many locals. Cars are not allowed in there but you can find huge meadows, running tracks, open-air theater stage or open-air baths. And there’s a large musical fountain greeting you at the entrance from Margaret Bridge. 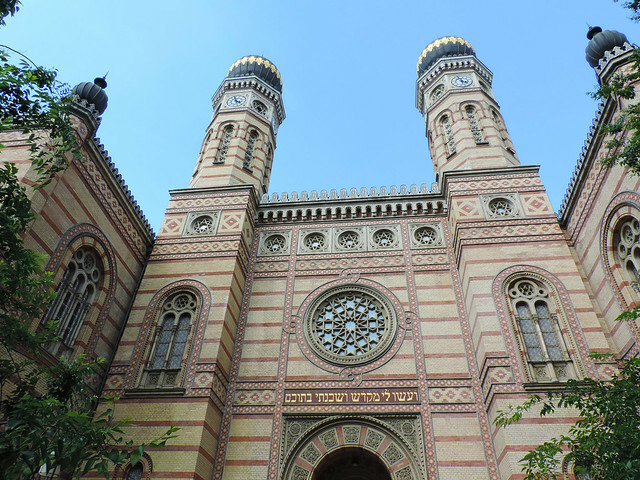 Budapest’s Great Synagogue is the second largest synagogue in the world – right after the one in New York City. It’s often referred as Dohány Street Synagogue and it’s not hard to guess where you can find it: Dohány Street 2. It was built in the Moorish Revival style and this exotic style makes it really stand out. It hosts the Hungarian Jewish Museum, too, and there’s a Holocaust Memorial Park in the courtyard. 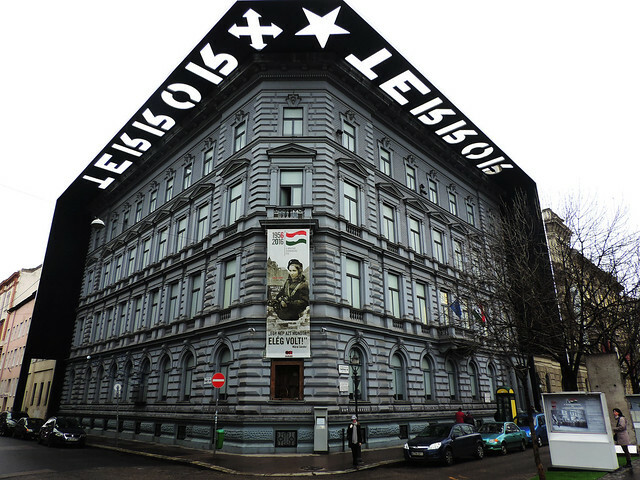 The House of Terror is one of the best museums in Hungary in our opinion. It has exhibits about the fascist and communist dictatorial regimes in the country and it was one of the most interesting (though definitely one of the most shocking) history lesson we’ve had in our lives. This museum covers everything from Second World War to everyday life in the communist era and it gave us a chance to understand a lot of things better and to reflect on the past. Read more about our visit in the House of Terror here! Hungary is the land of thermal spas. The country is blessed with countless thermal springs and several large and small Hungarian towns have their own famous spas. And Budapest is the city that has the most spas all over the world! It means 5 famous historical thermal baths in the first place: the amazing Art Nouveau building complex of Gellért Thermal Bath, Széchenyi Thermal Bath with its 21 different pools, Rudas Thermal Bath with its unique rooftop panorama pool, Lukács Thermal Bath and Király Baths that is a small Turkish Bath. If that’s not enough you can check out this page for the list of all spas and beaches in Budapest. Here’s a confession: ruin pubs turned out to be not our thing. It’s not that we never visit them, but we are far less enthusiastic about them than many others. Still we’d recommend you to go and check them out. First of all, it’s a fact that they are very popular – and probably the most popular among tourists. Then, apart from the fact whether we like them or not, one thing is for sure: they are unique and it’s worth giving them a shot. But what are they exactly? Well, this trend of the ruin pubs has started in Budapest in the past decade and it’s still getting more popular. The recipe is as follows: find an old abandoned building in downtown Pest, occupy it (rent it, I should say), fill it with furniture as old and rickety as possible, invite some contemporary artists to decorate the walls, serve some drinks, and people will love it. And the recipe seems to be quite good because a lot of people love these artsy, retro, funky places that recreate the atmosphere of the 70’s. They are Budapest’s unique way of entertainment. Szimpla Kert is the oldest ruin pub in the city but there are dozens more. Maybe we are not the best people to tell you which are the best but here’s a little help if you’d love to try them. At this point we probably reached the same length as our summary post about California. That’s what happens when we start writing about places that we know and love so much… Anyway, we’d like to finish this post with some useful tips and links about how to get around. You definitely don’t need a car, public transport is good for whatever you want. Actually, a car would only cause you headache because of crazy traffic and limited parking. Public transport is quite good even during the night. Tram 4 and Tram 6 have a 24 hours service; otherwise night lines have different routes and timetables than regular ones so check it if you’ll need to use them. Liszt Ferenc Airport is the only one in Budapest and getting to the city center from the airport is absolutely possible by public transport. Bus 200E and metro line M3 will be what you need in this case (except between 12 am to 4 am in the night, you better check the night service for that). Well, that’s it for now. We tried to keep this guide short and simple. At least we tried. Any questions? Anything we missed? Have you ever been to Budapest?